That’s good, because he’s probably not going to be. 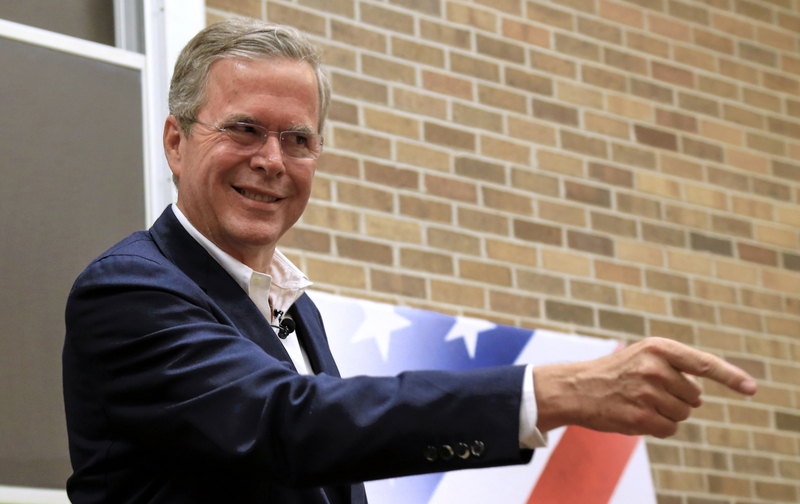 But poor entitled Jeb can’t help himself; he’s got to make it all about him. “I’ve got a lot of really cool things I could do other than sit around being miserable.” That’s a campaign slogan, all right. Elect the rich guy who could be doing “really cool things,” but gave them up for his country! Jeb 2016: Elect the rich guy who could be doing “really cool things,” but gave them up for his country! It’s not only that Trump would be a weak GOP nominee if he prevails; it’s that he’s been particularly and skillfully devastating to Bush, the former front-runner. It’s more than the charge that Bush is “low energy”—which sounds a little like those commercials for guys with “low-T,” a dog-whistle insult to Bush’s manhood. It’s the way Trump played Bush into a devastating defense of his brother’s national-security record, which will probably doom his campaign for the Republican nomination, but if it doesn’t, will leave him gravely wounded in a general-election campaign. Trump’s trolling led to this devastating question from CNN’s Jake Tapper last week: “If your brother and his administration bear no responsibility at all,” Tapper asks, “how do you then make the jump that President Obama and Secretary Clinton are responsible for what happened at Benghazi?” Bush’s stammering answer was an embarrassment. Thus Trump has turned the primary into a referendum on the presidency of George W. Bush, while making the worst possible critique: that Bush, who led us into two disastrous wars, also missed early warning signs of the 9/11 attack. He hardly “kept us safe,” before or after that infamous date. Day in, day out, Bush has looked as though he’s thinking what he shared with us on Saturday: “I’ve got a lot of really cool things I could do other than sit around being miserable.” Miserable he is, that’s very clear. Bush’s campaign was predicated on the belief that there was a clamor for an even-tempered GOP establishment conservative to save the party from its nihilist caucus. But while there may be such a demand among top donors, there isn’t from the party’s base. And donors may be giving up, too: Bush cut campaign salaries and turned some top staffers into volunteers last week amid reports that fundraising is getting tougher, as he remains mired in single digits in every poll. Yes, Bush really said “Blah, blah, blah, blah,” at a time when voters want reassurance of his competence. Yes, he really said, “Blah, blah, blah, blah,” at a time when voters, as well as donors, want reassurance of his fortitude and competence. He doesn’t seem to want this thing. And that’s good, because it doesn’t look like he’s going to get it.